A wonderful tribute to such a lovely person. I've signed up and also added a link to this on my sidebar. As you know I carry this linky list today, twice, I goofed. My badge links back to my linky list for any other days. Now all I have to do is figure out what kind of sunflower I can get. I'm posting about this in all kinds of groups and forums I'm part of. I would request everyone who signs up to help spread word on this, so on September 8 we can flood a whole big chunk of the internet with sunflowers! I am in! And I'll share it in my groups too! I'll help spread the news! This is a wonderful idea! It certainly is a great idea and one that I intend to be a part of. I'm going to work on the sunflower and hope that will be an easy find, but I'll think of something in time. Bless you all. I'll post this on my blog. This will be a beautiful tribute. 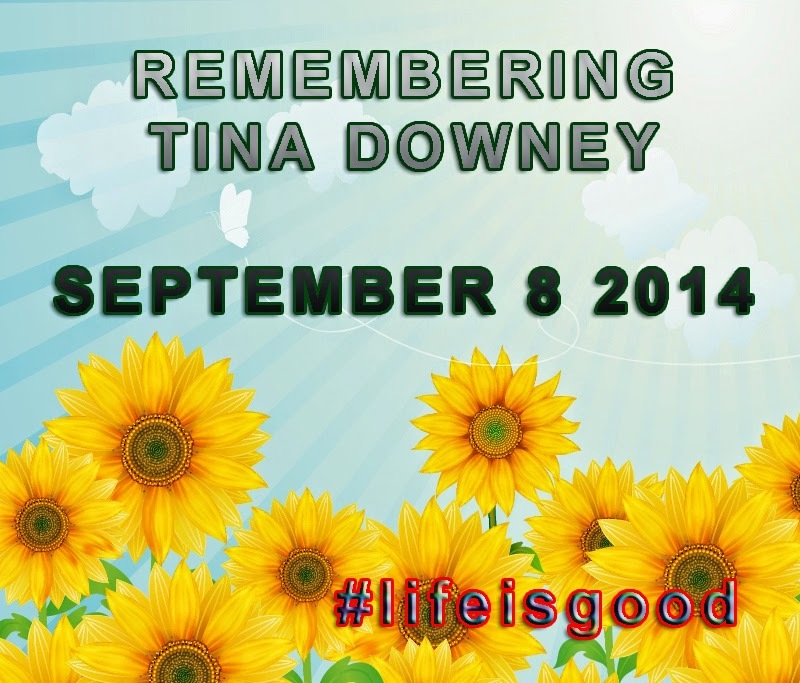 I hope it brings at least a small amount of comfort to her family to know how many lives Tina has touched. Great to see the blogging community come together like this. I'm sure Tina's family appreciates all the support. I never 'met' Tina online - but I wish I had. So sad to hear of her passing. She sounds like an incredible lady! A wonderful idea. Is it going to be connected to a charity? I just read this and I am sorry for the loss of your friend. I will participate in the hashtag for my posts on that day. I never got a chance to meet Tina, having only discovered her blog a few weeks ago. What a great tribute! So happy to have gotten to know her via our blogs and many wonderful emails I will go back to and read again and again. Yes, Maurice, we're trying to ensure that the badge that day is connected to a PayPal link created by her family. Anyone who wants to donate for Tina, can give to the Downey Education Fund, which would support the education of her sons. September 3rd, 2014, 4:52 P.M. Wonderful idea for a tribute. I'll do what I can to find a sunflower for Tina. Even if I have to paint one! May Sep 8 be a great day!! Wish You All A Great Day Today. this event in all my social networks. in each one of our life. to the bereaved family members. Didn't do a post, but shared on Facebook. Will also tweet.